Septic Tank Treatment : Bio-Safe One: B.O.S.S. Easy to use pre-measured bags. cleaned the Exxon Valdez Oil Spill. • Completely Digests Sewage, Paper, Soaps & Scum. • Proven to Rapidly Eliminate Odors and Unclog Pipes. • who help clean Exxon Valdez Oil Spill. • Safe to Humans, Pets, Plumbing and the Environment. FREE SHIPPING & HANDLING (A $15.00 Value)! 1. What is Bio-Safe One Septic Solution (BOSS)? uninterrupted air and water flow throughout your entire system from your pipes to your soil. 2. 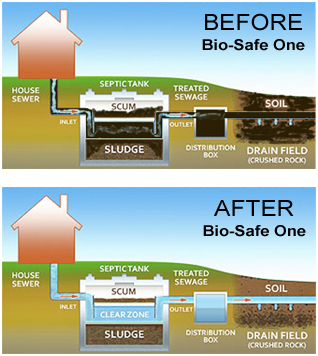 How does Bio-Safe One Septic Solution work? When BOSS is flushed down your toilet into your septic tank, a large volume and variety of bacteria are activated immediately upon contact with sludge and scum. Spore colonies in BOSS double every 20 minutes and replenish bacteria in the tank that have been destroyed by everyday use of soaps and chemicals. Through its superior enzymatic activity against specific substrates such as: lipase (grease), protease (protein and hair), cellulose (mold, vegetables and paper) and amylase (starch), BOSS digests and dissolves organic matter, breaks down their molecular structure and recycles wastes into minerals, water and oxygen. Trouble signs such as gurgling in pipes, surface water, slow drainage and odors will be reversed. Blockage caused by other factors such as an obstruction, damaged lines or a failed drain field, should be checked by a licensed professional. 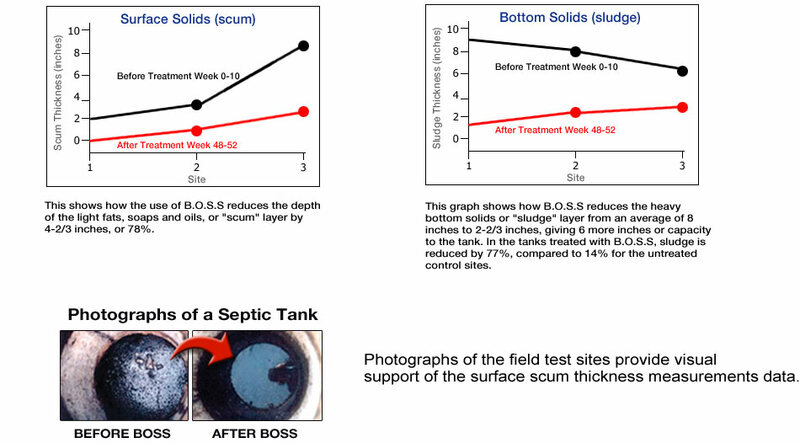 In a one year study on 3 separate sites, BOSS reduced the depth of the "scum" and "sludge" layers by about 80%. The "before" picture shows that there is a thick layer of dirty scum. You can see that the water level is almost to the top of the stained sides of the tank. The "after" picture show how clean the water is. Since the sewage has been consumed, you can see the reflection of the photographer on the surface. 4. Why should I use Bio-Safe Septic Solution (BOSS)? When used as directed, BOSS cleans and clears clogs throughout your entire system and eliminates the need for frequent pump-outs. By digesting up to 100 pounds of sludge and scum in only a 24-hour period, BOSS reduces the depth of these layers and increases the capacity of your tank. Poorly maintained systems have less than half their capacity because the depth of the scum and sludge layers take up more than 50% of the tank's volume. Contrary to popular belief, the bacteria that are already in your tank and other products that you may add to it, do Not produce the specific enzymes that dissolve difficult wastes and do Not have the neutralizing agents found in BOSS that combat detergents. It takes years to cultivate the specific types and volume of bacterial strands developed by our laboratories, especially the anaerobic cultures necessary to combat difficult wastes such as grease and paper. BOSS has trillions of bacteria per gram and our formulas are unique and effective. 5. 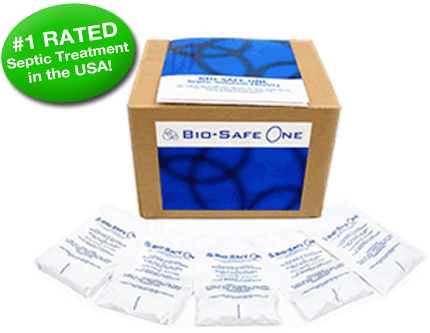 Is Bio-Safe One Septic Solution safe? The bacterial cultures introduced by BOSS are laboratory tested and guaranteed 100% gram positive and non-pathogenic (non-hazardous). Unlike chemicals, BOSS is the most effective means of dissolving wastes and is environmentally friendly and safe. It is harmless to humans, plants and animals as well as to your pipes, lines and water supply. Our similar product was successfully used to clear the Alaskan Exxon Valdez Oil Spill in 1989. 6. How does Bio-Safe One Septic Solution (BOSS) protect my soil? wastewater from backing up into your tank and home along with foul odors. BOSS reduces the volume of sewage in the tank and increases the "'clear zone"
into your soil and harden it. and why you need our products to restore and maintain your septic system. 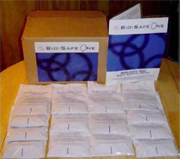 Bio-Safe One is your solution. © 2000-2011, Bio-Safe One, All rights reserved.